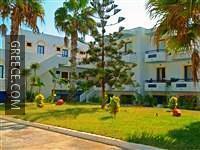 Set in Lampi, the Apellis Hotel Lampi is within easy driving distance of Kos and Tigkaki. The Apellis Hotel Lampi offers cosy rooms, furnished to accommodate the needs of any traveller. Kos Island International Airport is less than a 40-minute drive from the Apellis Hotel Lampi. Agios Fokas Beach and Therma Beach are under a 20-minute car ride from the hotel.